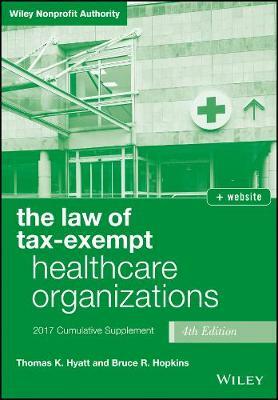 The Law of Tax-Exempt Healthcare Organizations is a one-stop reference for organizations and their advisors, providing accessible explanations of the complex legal framework surrounding tax-exempt status, healthcare organizations, and other pertinent regulations. This new supplement has been updated to reflect the latest changes to federal law, IRS forms, requirements, and related tax procedures, with extensive citations to facilitate further research if needed. Coverage includes healthcare reform, the Affordable Care Act, activities of tax-exempt organizations, political campaign activity, charitable reforms, intermediate sanctions, and more, including the fiduciary duty of directors on the governing body of nonprofit organizations. Organized for easy navigation and quick reference, this book is also valuable as a learning resource for nonprofit professionals seeking to make more informed decisions for their organizations. The laws and regulations surrounding both health care and the nonprofit world are continuously evolving; when the two fields merge in a single organization, they create a legal area that is continuously in flux. This book provides up-to-the-minute guidance on all relevant aspects of federal law to ensure the clear understanding that streamlines compliance. By compiling all legal and tax-related information specific to tax-exempt health care organizations into a single volume, this book dramatically reduces research time and eliminates the need to wade through legal libraries to locate specific information it's all here. The Law of Tax-Exempt Healthcare Organizations is the must-have reference with the latest information and down-to-earth explanations.